So few shows, so many nominations. The Tony Awards are so different from the Oscars and the Emmys, where it’s just an honor to be nominated. With the Tonys, it’s shameful not to be nominated, because in many categories that puts you in the minority. 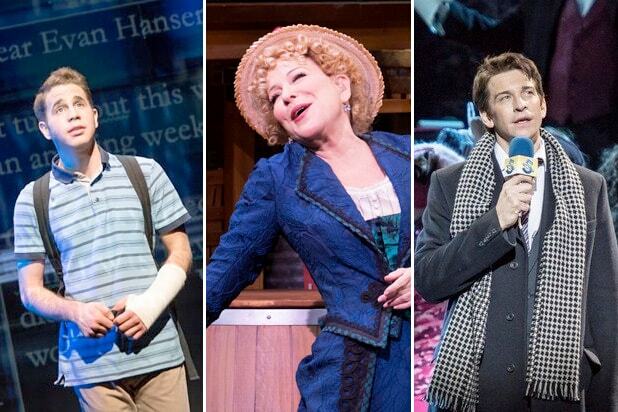 To explain what I mean, let’s begin with the possible nominees for best revival of a musical. In the 2016-17 Broadway season, one of the five musical revivals that opened will not be nominated. I think that loser slot is a close contest between “Cats” and “Miss Saigon,” since “Falsettos,” “Hello, Dolly!” and “Sunset Boulevard” are sure to make the cut. Nominations for best revival of a play draw from a slighter larger pool (nine shows), and to accommodate such a plethora of talent, it’s likely that the Tonys will nominate five shows. “Jitney,” “The Little Foxes,” and “The Price” look likely to make the winners circle. The radical staging of “The Glass Menagerie” has not won the acclaim (or the box office) of last year’s bad-boy revivals from Ivo van Hove, “The Crucible” and “A View From the Bridge,” but deserves to be included, with the uneven “Present Laughter” and “Six Degrees of Separation” possible contenders. Broadway’s many Anglophiles probably won’t let it happen, but the race for best original play could be an American sweep: Lucas Hnath’s “A Doll’s House, Part 2,” Lynn Nottage’s “Sweat,” J.T. Rogers’ “Oslo” and Paula Vogel’s “Indecent.” If there’s a fifth nomination, I’d like to see the Yankee sweep continue with the somewhat flawed “Significant Other” by Joshua Harmon, but it’s more likely that extra nomination would go to the deeply pretentious “Heisenberg” by Simon Stephens, a Brit. Bette Midler (“Hello, Dolly!”) should lead the field for Best Actress in a Musical, along with fellow veterans Christine Eversole and Patti LuPone, both for “War Paint.” That leaves a slew of youngsters to scramble for the other two slots: Christy Altomare (“Anastasia”), Denee Benton (“The Great Comet”), Eva Noblezada (“Miss Saigon), and Phillipa Soo (“Amelie”). I could hardly tell these Disney princesses apart. That’s not true of the young and very quirky Annaleigh Ashford, who gets the shaft because of the producers of “Sunday in the Park With George” without whom she would easily take her place among the three vets. Likewise, Jake Gyllenhaal would have been a shoo-in for his lead turn in “Sunday in the Park.” Expect David Hyde Pierce (“Hello, Dolly!”), Andy Karl (“Groundhog Day”), and Ben Platt (“Dear Evan Hansen”) to be nominated for best actor in a musical. Intriguing is the fate of Christian Borle, who scored in two musicals this season, “Charlie and the Chocolate Factory” and “Falsettos.” The nominators would be expected to go with his performance in the show still running (“Charlie”); then again, the show already closed (“Falsettos”) didn’t get panned as “Charlie” has. In some circles, giving a great performance in a not-good show makes an actor the best. It’s doubtful that the Tony people think that way, unfortunately. Also of interest is Josh Groban (“The Great Comet”) and Jon Jon Briones (“Miss Saigon”). Groban’s star power (not to mention his reviews) should nab him a nomination despite Tony nominators’ history of snubbing celebs. Just ask Ricky Martin, Matthew Morrison and Daniel Radcliffe. For best actress in a play, nominators will likely go with four starry performances still on the boards: Sally Field (“The Glass Menagerie”), Allison Janney (“Six Degrees of Separation”), Laura Linney (“The Little Foxes”) and Laurie Metcalf (“A Dolls House, Part 2”). The fifth slot should either go to Cate Blanchett (“The Present”) or Mary-Louise Parker (“Heisenberg”), whose shows have shuttered. In the Best Actor category, too, Corey Hawkins (“Six Degrees of Separation”), Kevin Kline (“Present Laughter”) and Mark Ruffalo (“The Price”) will all benefit from the fact that their shows are also still running. That could leave Denis Arndt (“Heisenberg”), Simon McBurney (“The Encounter”), or Richard Roxburgh (“The Present”) out in the cold, although all three deserve to be included. Nominees for best director of a play look to be Ruben Santiago-Hudson (“Jitney”), Bartlett Sher (“Oslo”), Daniel Sullivan (“The Little Foxes”), Rebecca Taichman (“Indecent”), and Kate Whoriskey (“Sweat”). Sam Gold (“A Doll’s House, Part 2” or “The Glass Menagerie”) deserves the prize, not just a nomination, but his double duty might hurt his chances. There are only two sure bets for best director of a musical: Michael Greif (“Dear Evan Hansen”) and Rachel Chavkin (“The Great Comet”). He directed the musical most likely to win the Tony; she directed the musical most dependent on its staging. Greif also deserves to be nominated for “War Paint,” but will probably have to settle for just one nomination this year. Four men are vying for the other three slots: Christopher Ashley (“Come From Away”), James Lapine (“Falsettos”), Matthew Warchus (“Groundhog Day”) and Jerry Zaks (“Hello, Dolly!”), who re-created Gower Champions’ legendary staging. Still, Zaks’s creative hand is evident in not only Midler’s star turn but all the marvelous performances orbiting around her.